The Sheraton Albuquerque Uptown Hotel needed to correct a problem. Its airline crew-room contracts required meeting arriving flights on time and transporting crews back to the hotel for their stay. Easily done. Property staff just needed to be aware of when the appropriate planes arrived. 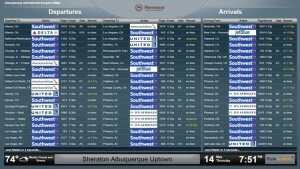 Guests also wanted to know if their departing flights were on time. The property’s issue was with mobile devices and the ‘handheld hypnotism’ we are all familiar with. 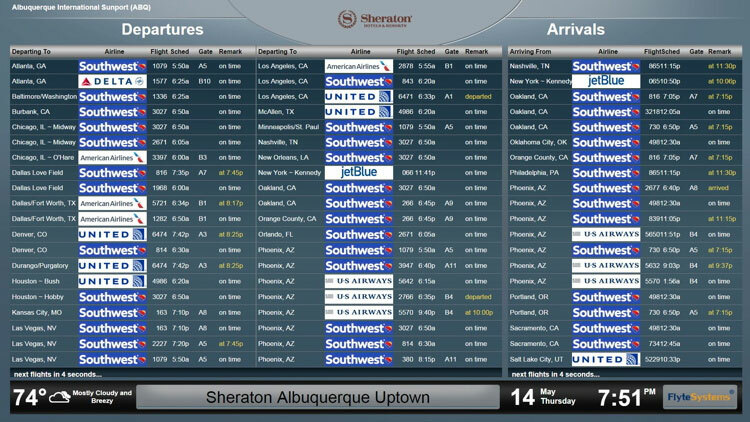 Flyte Systems is the leading provider of cost effective airport travel information displays and content for the hospitality, corporate training centers, digital signage, and convention center industries and related businesses. Click here to request information on Flyte Systems’ airport travel and guest information services. The Sheraton Albuquerque Uptown Hotel is 9 miles from the airport located in the heart of Albuquerque’s newly-developed Uptown Area, surrounded by a number of corporate headquarters. The property offers 295 guest rooms with pillow-top mattresses and plush sheets on Sheraton’s signature Sweet Sleeper bed. Rooms feature a stylish desk complete with an ergonomic chair. Guests power up in the morning with an in-room coffee maker and ready-to-brew Starbucks coffee and Tazo tea.